Based out of the Washington, D.C. area, Joel Patel is an automotive journalist that hails from Northern Virginia. His work has been featured on various automotive outlets, including Autoweek, Digital Trends, and Autoblog. When not writing about cars, Joel enjoys trying new foods, wrenching on his car, and watching horror movies. The Kia Forte competes in the cut-throat compact segment. And against the likes of Honda Civic, Mazda3, Volkswagen Golf, and Chevrolet Cruze, the only appealing thing about the South Korean vehicle is its lengthy list of features. A redesigned model could mend that issue and according to images Kia released earlier this week, an all-new Forte will make its debut at the 2018 North American International Auto Show in the next few days. The pictures that the automaker released of the 2019 Forte were renderings of the compact sedan, but provided a decent look at what the all-new model would look like. The overall design of the vehicle is more aggressive, which is something that could help the Forte stand out in the segment. The front end is particularly stylish, mimicking the design of the Kia Stinger with creases in the hood, large air intakes, and distinctive headlights. The side profile of the 2019 Forte features, according to the automaker, a swept-back design that replaces the old model’s cab-forward look, which, once again, comes from the Stinger. The back is a little more unique to the compact vehicle with LED taillights, a horizontal trim piece connecting the taillights, and creases that accent the car’s width. On the inside, it looks like Kia will go with a cleaner, less-cluttered look. A display, which we assume will be a touchscreen, is perched atop of the dashboard instead of being integrated directly into it. The center stack is straightforward, as well, with minimal buttons. And there’s a touch of Stinger on the inside, as well, with aeronautically inspired circular vents. Apparently, Kia’s going for a “horizontal theme” to create a sense of openness. 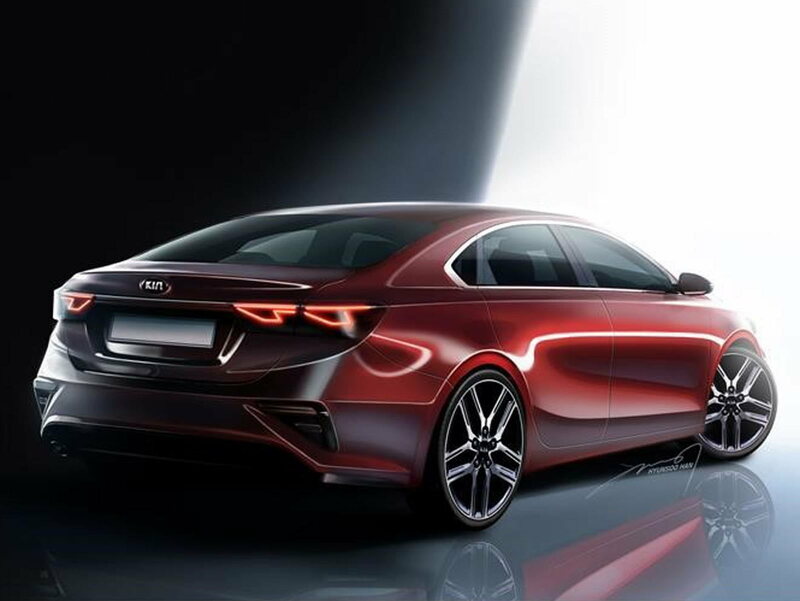 CarsDirect's sister site, Motor Authority, claims that the sedan body style of the new Forte will be on display in Detroit, while the hatchback will come out later this year. A two-door version of the Forte isn’t likely, as Kia dropped the Forte Koup at the end of 2016. 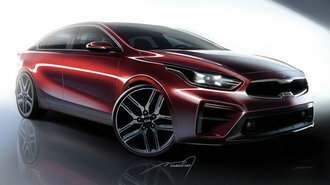 Kia didn’t provide any information on what kind of powertrains the new Forte will have. As a quick reminder, the current model is available with two engine options – a 147-horsepower 2.0-liter inline-four and a direct-injection version of the engine that makes 164 hp. The Forte5 has the 164-hp inline-four as its base engine and a 201-hp 1.6-liter turbocharged inline-four on the range-topping trim. We can help you get financing, no matter your credit situation. Just enter your zip code to start.